The building measures 3.6 x 6.0m and is clad with smooth shiplap painted in the exterior Sikkens preservative stain in Walnut. This allows the natural beauty of the wood grain to show through whilst still affording some protection and an attractive aesthetic. 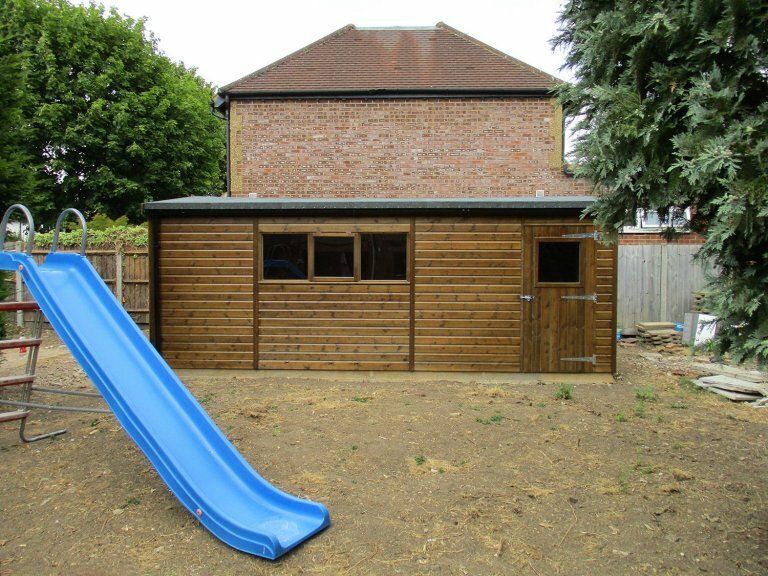 It has an apex roof covered with our heavy-duty, heat-bonded felt and an up-and-over garage door in the gable. There is also a separate single access door in the length with several windows, including one opening window for ventilation. Internally, the customer opted for one of our sturdy and reliable workbenches so that they can pursue projects inside the garage too. Black guttering has also been added to the fascia boards to keep off wetter weather and protect the building from the elements. 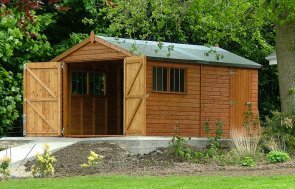 If you are also seeking a high-quality, tailor-made timber garage that can be hand-built to suit your exact requirements, we warmly invite you to your nearest show site where you can speak with friendly experts about your ideal building. Locate your nearest one here or get in touch on 01760 444229 to plan your visit.